I have to start out by thanking my friend Cathy for giving me the "pinspiration" for this project. She sent me this pin about Japanese knot bags. I had never seen such a thing before, but was intrigued by the concept and so I set about designing my own bag. My finished bag is about 11 1/2 inches wide and 10 inches deep. It's a simple yet functional and can be used as a small purse to carry your essentials. 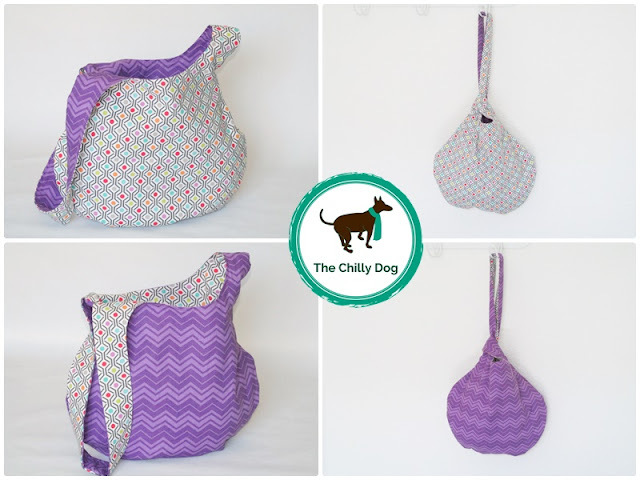 I'll be using mine to carry knit and crochet yarn projects when I'm on the go. And did I mention that the bag is reversible? You can use two different colors of fabric to suit your mood. 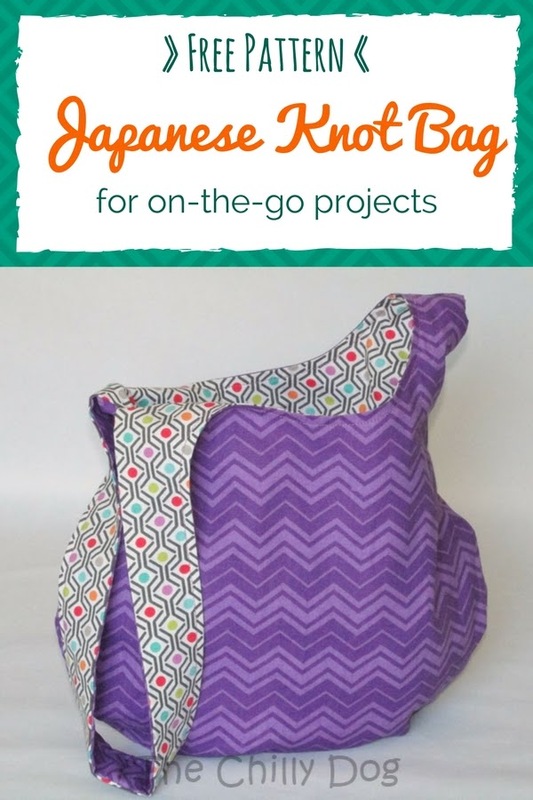 Note: a printable version of this Japanese knot bag pattern with actual size pattern pieces (no enlarging required) is available in my pattern shop. Before you begin, wash, dry and press each of your pieces of fabric and print the pattern PDF. To begin you'll need to enlarge the pattern 200%. On my printer/copier, I had to cut the pattern into quarters and enlarge each page separately and then tape them together. Fold each of your fabric pieces in half so the selvages match up. The straps of the bag should be parallel to the selvages. Cut out the pattern. Place the pieces with the right sides of the same colored fabrics together. Pin and stitch along the top edge of the long strap. With a water soluble fabric marker, on the wrong sides of all 4 pieces of fabric, mark the two side arrows from the pattern. To minimize the amount of hand stitching, the assembly of the bag is a little unconventional. Open up both of the bag pieces. Lay the pieces right sides together and pin. Machine stitch the outside edge of the long strap between your marked arrows. Stitch around the inner "U" on each side and along the inside of the long strap. Trim the seam allowance along the "U" on each side to 1/4 inch so the bag is easier to turn. Next, turn the bag right sides out by pulling one side through the long strap. This takes a bit of patience. Press around the "U" on each side and along the long strap. Pin the top edges of the short strap right sides together so that the same colored fabrics are facing each other. Stitch along the top edge. Press the short strap seam. The bag is starting to take shape. To add a nice finished look to the bag, I like to stitch about 1/4 inch from the edge all the way around the inner edges of the straps and the "U" shaped opening. You can use a decorative stitch if you like. I chose a plain, straight stitch since my fabrics already have strong geometric designs. Now you need to close up the bottom of the bag. Pin the right sides of the main fabric together and stitch between the arrows you marked earlier. Now do the same with the contrasting side. There should still be an opening through the short strap. Turn the bag right side out through that opening. You'll finish the bag by turning the outer edges of the short strap under 1/2 inch. Hand stitch around the outer edge of the short strap. I used a simple whipstitch and it's nearly invisible. Fill your bag with all your goodies. To secure everything inside the bag, simply pull the long strap through the short strap. Then, you can use the long strap to carry your pretty new bag. Tutorial: How to make a reversible Japanese knot bag.